North Shore/South Shore Works by Howard & Linda Beckerman | Patchogue Arts Council, Inc. 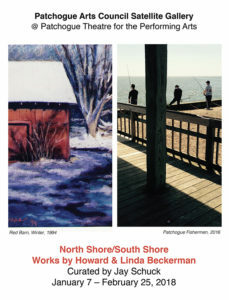 The Patchogue Arts Council is proud to present North Shore/South Shore, a two-person exhibition featuring the photography and paintings of Howard and Linda Beckerman. Despite their differences in medium, the works reflect the scenic imagery of the North and South Shores of Long Island. The exhibition is curated by Jay Schuck and is on view at the Patchogue Theatre for the Performing Arts from January 7 – February 25, 2018. The exhibition is open to the public during the theatre’s hours of operation. Howard Beckerman is a Patchogue-based composer, lyricist, playwright, and photographer. He received an MA in Applied Linguistics from Columbia University and a BA in Linguistics from CUNY Queens College. He and his wife Linda are co-founders of Worldwide Voices, Inc. (www.worldwidevoices.org), a not-for-profit organization that manages projects that support the arts and media programs through creative collaboration with multicultural groups and individuals. Beckerman’s photographs of the Long Island South Shore have been exhibited locally with select exhibitions at Artspace Patchogue and the Patchogue Arts Council Gallery. Linda Beckerman is a multi-disciplinary artist, currently living in Patchogue, NY. She received an MFA in Painting from Rochester Institute of Technology and a BA in Studio Art from CUNY Queens College. She and her husband Howard are co-founders of Heartworks International, Inc., an arts, media, and language education company (www.heartworks.com), as well as Worldwide Voices. Her artwork has been exhibited throughout New York, with select exhibitions at the Islip Art Museum, Patchogue Arts Council Gallery, and the Metropolitan Art Center in Rochester.